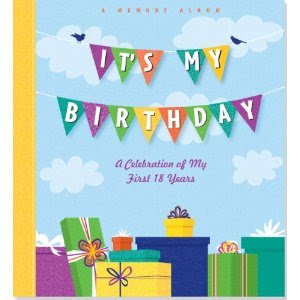 It's My Birthday: A Celebration of My First 18 Years is a memory album which has recently been released by Peter Pauper Press. I was definitely curious to check it out, thinking that if I liked it well enough, I'd purchase a copy for each of our children. Children do love birthdays and scrapbooks of themselves. I've tried hard to scrapbook for them but, as it goes, the more children who have entered into our family, the less time I find myself with to scrapbook! It's a fun hobby, and a great way to make and keep memories for our kids. I just lack the necessary time. Hence, I wanted to look into It's My Birthday: A Celebration of My First 18 Years . It is a colorful three-ring binder with 80 birthday pages for you to fill in. The pages allow you to document your children's birthdays, year by year, from birth to age 18. (Clever subtitle, that!) There are photo pages (like you might see in an "old fashioned" photo album) to include extra photos of your birthday boy or girl. Then there are designated areas to include things like hand and foot prints and particular memories. I probably won't be buying copies for each of my kids as a result of the concerns I have about the questions I mentioned. But I don't mind reviewing it all the same because you might simply choose to overlook those questions. (Or, you might not care about them as I do.) It's not a bad book - I just wish that they hadn't focused on any aspect of teenage angst. I have a feeling that this is not something that either parents or child which to fixate on or remember. So, there you have my honest thoughts! Thanks to Peter Pauper Press for shooting a copy my way. I appreciated the opportunity to check this title out! I agree with you on the teenage angst questions on this review. There are some challenges to parenting my teens, but for the most part, we have wonderful, wonderful days together. That's too bad. They could have framed it much more positively. There are definitely struggles as kids grow up, but I detest this idea that teens have to be at enmity with their parents (or at best just tolerate them). Teens and parents can get through those years with love and a good relationship. I tried scrapbooking for awhile right after Grasshopper was born, but lost interest pretty quick. ;P These sound perfect for me, other than the teenage angst part. Oh man that is unfortunate! It's such a good idea for the less crafty moms, but they could have at least said "Things I enjoy doing with my family." wow, I am not quitw sure where i rank in age against any of the other mom's but i have 2 teenagers at home now (15 and 16 and a 23 year old who lives in a foreign country. Married a boy she introduced us parents to for 4 minutes and we have a lovely 2 1/2 year old grand-s0n. But back to the book. I am going to buy the book because for one, i remember loving my parents but maybe not liking them all the time and that is o.k. my mother now lives with me and I have to say I love you to pieces and thank her for serviving my teens. Sadly my dad did not. But now my grandson will have his mom to think she is a nerd when he hits puberty! life is a never ending gift. Don't be afraid of the hard days, they make us better!